Google Adwords is the king of online advertising. However, advertising online always consists of two different sections. There is the advertising side where advertisers pay for their adverts to be clicked on so that the reader reaches their landing page. The other side is the publisher side where website owners place adverts on their websites hoping they will get clicked upon making them money. Google Adwords very much relies on Google Adsense and vice versa. The advertisers cannot get traffic from their PPC campaigns if there are no publishers to display their adverts. For this reason, it can be considered that Adsense is just as important as Adwords is to Google. There needs to be a balance between them too. Too many advertisers and the CPC for keywords increases. Too little publishers and the CPC, again, increases. However, Google have the balance just right satisfying millions of publishers and advertisers alike. 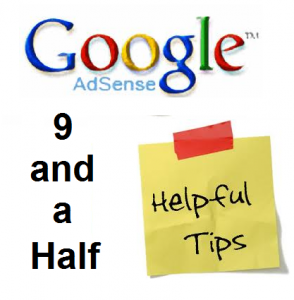 Just like I made an article stating 21 Pay Per Click Tips For Beginners, here is an article on 9 (and a half) tips of the publishing side of PPC and Google being Adsense. Sometimes, knowing the ‘other half’ can prove more beneficial than you know. As well as this, if you are a publisher, it will give you some valuable tips. Your earnings for Adsense can be calculated manually through the equation: Ad impressions x CTR x Average CPC x Smart Pricing Factor. Experiment with ad placement as it can affect the performance of your adverts. As a rule of thumb, adverts immediately above and below the content are most successful: followed by adverts in the sidebar on the left. Experiment with ad colours. There are three options you can choose. Blend – This is where your adverts look camouflaged like normal links on your page. Compliment – This is where you use similar colours to ‘compliment’ your webpage but make clear they are adverts. Contrast – This is where the colours completely contrast against all colours on the page to attract attention to itself. Experiment with ad sizes. Another rule of thumb is that the squarer the advert, the more successful it will be although the 160×600 advert in a sidebar is also successful too. Allow and block ads – This option can seriously increase CTR as I have already mentioned before. Blocking the categories that don’t apply to your website’s content will remove ad impressions that will have low CTRs. NEVER ever click on your own ads. You cannot beat Google at their own game they have been doing since 2000. Don’t constantly keep changing your adverts. Yes, it is healthy to experiment. However, changing your ad colours, positions and sizes will sure enough annoy your readers. CTR stands for ‘Click Through Rate’ and refers to the percentage of users that click on your adverts. A healthy (from my opinion) CTR is 2%+. CPC stands for ‘Cost per Click’ and refers to the payout you get for the click you had on one of your ad zones. This isn’t what the advertiser paid for that click as Google take 42% of the money from the advertiser leaving you 68% off the value of the advertiser’s click. If an advertiser pays out $2.50 for a click, you will only get $1.70. Now, you may be wondering what the ‘smart factor pricing’ is? It is a way for Google to determine how valuable the click has been to the advertiser from your website. It helps stop scams such as click fraud from making money. Google does this by taking into account your site’s impressions, relevance, size, page rank, age, inbound link relevancy and CTR. Therefore, if your CPC is low, don’t blame it on the advertisers as it might by your website’s poor performance in determining it’s smart pricing factor that is causing the low CPC!